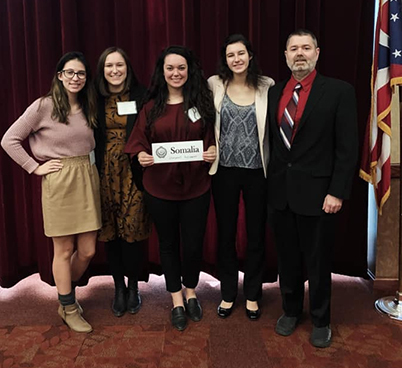 Members of the WKU Model Arab League team (from left) are Brenna Mathews, Arabic and Political Science major from Frankfort; Sarah Beth Sarver, Arabic and Computer Science major from Glendale; Emma White, Arabic and Criminology major from London; Hannah Chaney, Arabic and Biology major from Louisville; and Dr. David DiMeo, faculty advisor from the Department of Modern Languages. The conference simulates the sessions of the League of Arab States, with each school representing a member state of the league. This year, WKU represented Somalia, while in the past, the team has been Saudi Arabia, the United Arab Emirates and Jordan. Members of the team are preparing to represent Jordan at the national level competition April 4-7 in Washington, D.C.
Based on their performance at the regional competition, members of the team have been invited to participate in the national conference. “While the four participating members vary in their studies, it is incredible to watch the future leaders of the world come together to discuss and solve problems with policy,” White said.